The first bone to develop in the human fetus is the ear bone. Likewise, the first sense to develop in the fetus is hearing. Moreover, hearing is the last sense to go when we die. According to all major spiritual and religious texts the universe was created and brought forth into form through sound. Th Upanishads, the oldest spiritual text on our planet (10,000 years older than the Bible), actually translates into “The Last Song”. The Hindu Bhagavad-Gita (3,000 years older than the Bible) translates into “Celestial Song”. Hindus says that the sound “OM” is the creative energy used to bring the universe into existence. Egyptian religious texts state that the Singing Sun created the world with its cry of light. And the Christian sacred text declares that, “In the beginning was the Word, and the Word was with God, and the Word was God” (John 1:1). One Biblical translation of “Word” in this text is “Primary Harmony” (Robertson, S., “Music’s Divine Healing Power”, ProgressiveChristianity.org, June 23, 2017). Spiritually, music can attune us to the Cosmic Vibration. Take the Didgeridoo, for example – used by Australian Aborigines in songs and ceremonies for over 40,000 years. It is believed by some that the didgeridoo is a key tool in the creation of the world and invented directly by the gods. The didgeridoo is an instrument that produces low frequency sound that we can hear and actual vibrations that we can feel if placed close to the body, creating soothing and healing emotions. A sense of well being (Gavin plays didgeridoo). Tingshas can be found in the Tibetan Buddhist tradition. Tingshas are a pair of small cymbals connect by a strap – often used to call the people to worship. Tingshas are used for clearing negative energies and are used in Feng Shui to clear the energy present in a room. We play the tingsha in the four directions of the earth. (Gavin plays tingshas). Thank you, Gavin, for gathering the Spirits of every culture from East to West and connecting us to the Holy Presence of God present with us here in this sanctuary today. “Praise God with tambourine and dance!” declares the Psalmist. Why the tambourine? In the book of Exodus, we hear that Miriam took a tambourine and led all the women as they played their tambourines and danced. The story behind the tambourine and dancing: Miriam, Moses, Aaron and the Hebrews fled Egypt. They crossed the Red Sea. Meanwhile, the Egyptian army pursued them. They made it across the sea safely and into the land of freedom. They could only take a few precious items with them in their hurry as they tried to escape from the Egyptians. What was one of those items that Miriam took? A tambourine. Miriam packed a tambourine even before she knew how the story would end. She trusted God enough that even though the situation looked dim, she would dance again. She would have reason to celebrate again. She trusted that the God of the Dance would provide music once again. Yes, today is a day worthy of dance! As we celebrate the conclusion of the capital campaign, we praise God with a trumpet fanfare (Steve plays trumpet sound). We praise God with tambourine and dance (Peter to play.) We praise God with strings (Lara plays piano.) Yes, the piano is technically a stringed instrument. And we praise God on the grand piano. 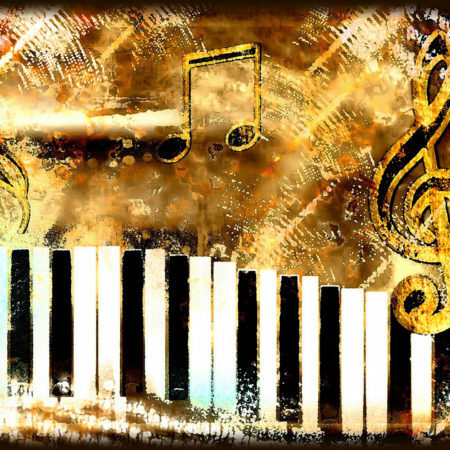 One person said, “The piano keys are black and white, but they sound like a million colors in your mind” (Maria Christina Mena). And we praise God with the pipe. (Lara plays the organ.) And we reinforce our Hallelujahs with loud clashing, clanging cymbals! (Gavin plays cymbals.) Let everything that breathes praise the Lord!